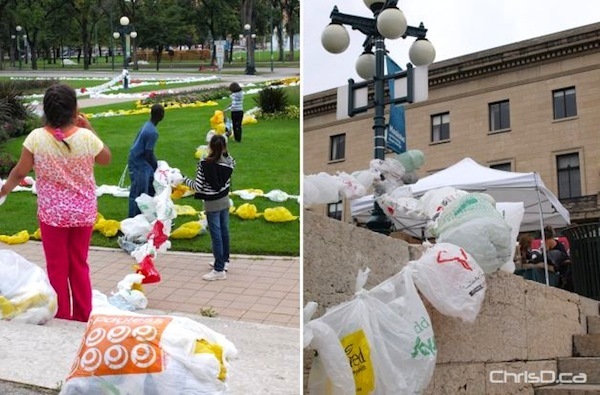 To help keep plastic bags out of Canada’s landfills and the environment in general, Winnipeggers brought their unwanted bags to the Manitoba legislature on Saturday as part of Plastic Bag Day. As shown above, students from Weston School lined the bags in one big chain to surround the legislative grounds. For every six to 10 plastic bags that were exchanged, a reusable Sobeys shopping bag or bio degradable waste bags for your pet were given out. City resident Don Woodstock is behind the initiative. You may remember Don’s name as being the one who spearheaded the campaign to have garbage day renamed to ‘recycling day’ earlier this year.